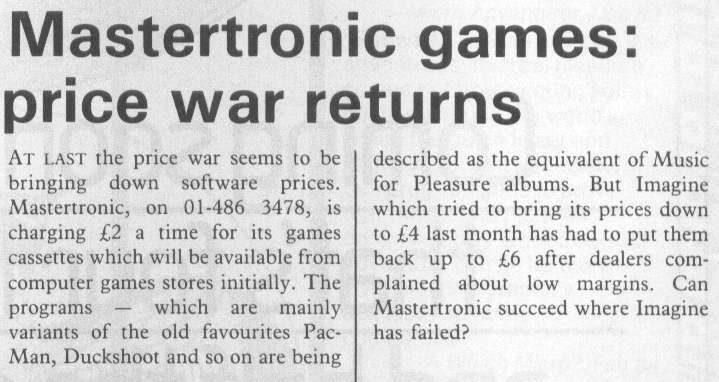 Your Computer, May1984, in one what must be one of the earliest mentions of Mastertronic in the press. The reference to Imagine trying to cut prices and meeting dealer resistance is symptomatic of market attitudes. Mastertronic had to develop its own dealer network to get its product out onto the shelves. Imagine ceased trading later in the year. Given they had boasted in recruitment ads that they employed 100 programmers, I am not surprised.